For his birthday, my husband requested a “golden yellow cake with chocolate frosting.” The girls tried to persuade him to give pineapple cake a try. He politely declined. They urged him to go the cupcake route this year … no dice. So, golden yellow cake with chocolate frosting it would be. For a super-delicious, gluten-free, out of the box “golden yellow” cake, I will give two thumbs up to the King Arthur Gluten-Free Vanilla Cake Mix. We have used it a handful of times and every time it has been a huge success. Something that drives me nuts about most gluten-free cake mixes is that a pricey boxed mix will only get you a single layer cake or a dozen cupcakes. King Arthur Flour doesn’t mess around … 24 cupcakes or a 2 layer cake … or, in our case, a beautiful “golden yellow” bundt cake. 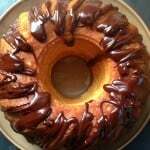 Once we had our beautiful bundt cake sitting on the counter, waiting for some frosting love, my daughter suggested that we make a ganache. You know, since all 9 year olds know about these things… The only problem with her ganache request was that we had no cream in the house. Traditional ganache is so easy – high quality chocolate and cream. Done. 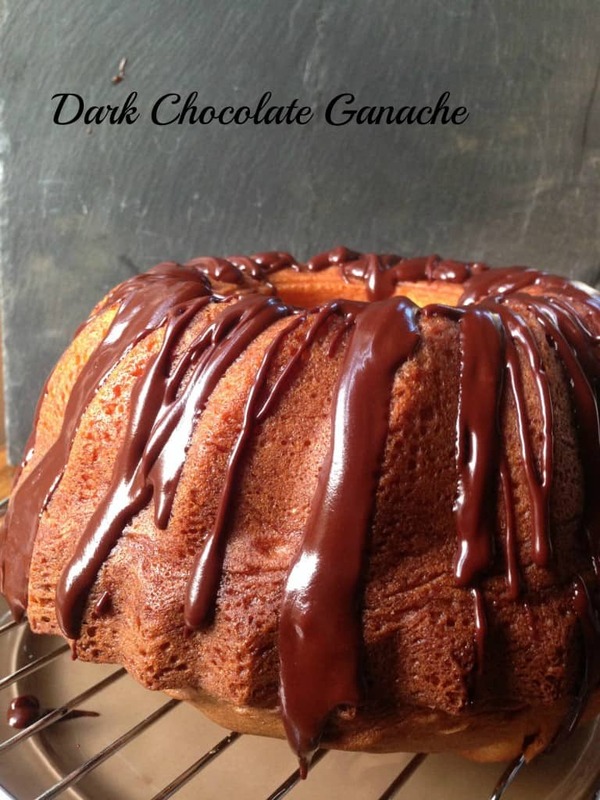 I searched around on the web a bit to find some ideas for a ganache without cream… I dare you, search for that. You are not going to get a lot of results. When you start with chocolate this good, you don’t need to do much to it. 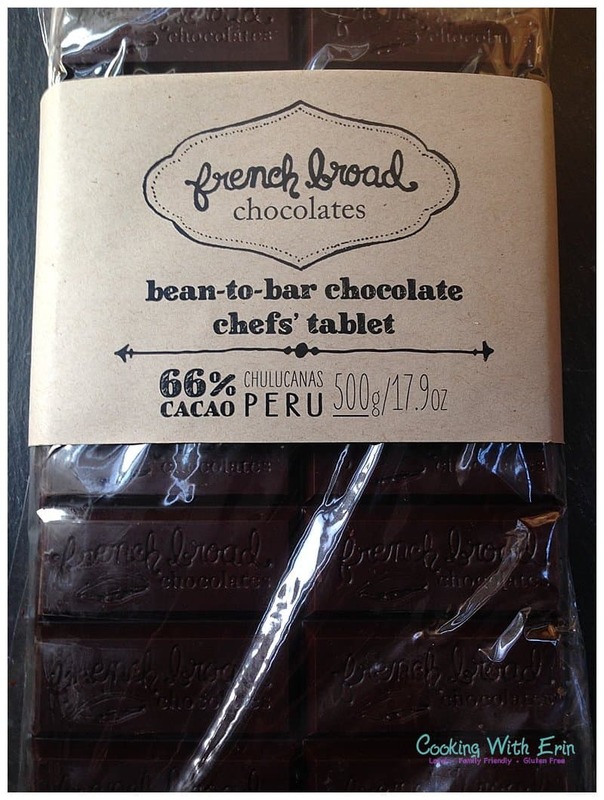 This chef’s bar is 500 grams of chocolate. 500 grams is roughly equivalent to 18 ounces. I used 1/5 of this bar – 100 grams of chocolate. For your math problem today, how many ounces of chocolate is that equivalent to? Quick, quick … almost 3.5 ounces! I combined milk and unsalted butter in my double boiler and heated that over low heat until the butter melted. I added the four large squares of chocolate and gently stirred the chocolate until it was completely melted. Keep the heat on medium low to low. My kids thought the ganache needed a little more sweetness so I added two teaspoons of sugar but I will leave the sweet decision up to you… You might like the sharp contrast of the dark chocolate with the sweet vanilla cake flavors. All in all, I will say that our Chocolate Ganache Without Cream experimentation was a huge success. The ganache dripped on nice and thick and held up well for the two days that this cake survived before being completely gobbled up. These measurements worked for us but because we are talking about drippy, gooey chocolate, there is a lot of room for flexibility… Enjoy! In a double boiler, combine the milk and butter over low to medium low heat. Add the chocolate. Stir until the chocolate is melted. Taste test! Add sugar if necessary. Drizzle over your favorite cake, cupcakes, or ice cream. Enjoy! oooh, yellow cake with chocolate frosting is by far MY FAVORITE. this ganache looks good! My husband agrees with you!! It is his request every year! 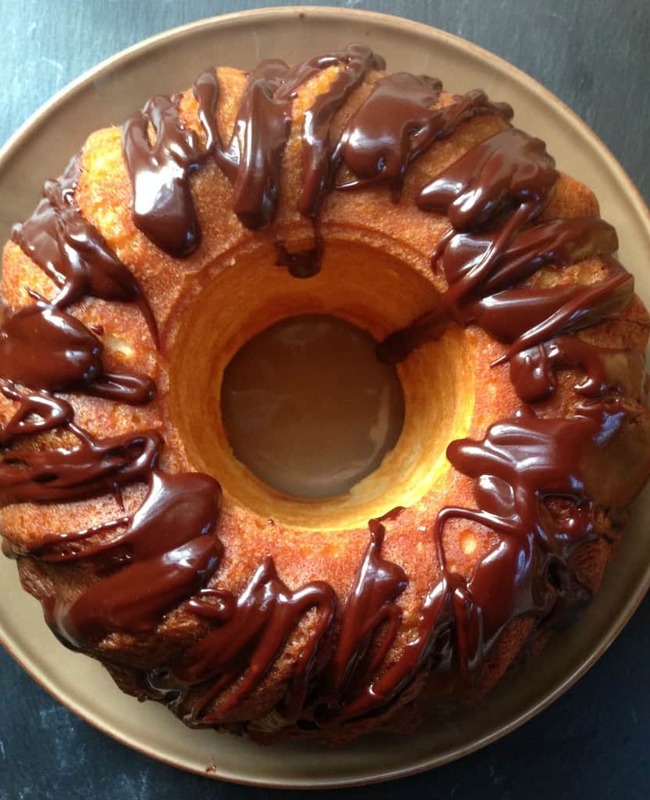 Love chocolate ganache and this one looks so good and so tempting! Love that you made it without cream. Thanks, Neli! Is there anything better than chocolate drizzled everywhere??? Total yum! 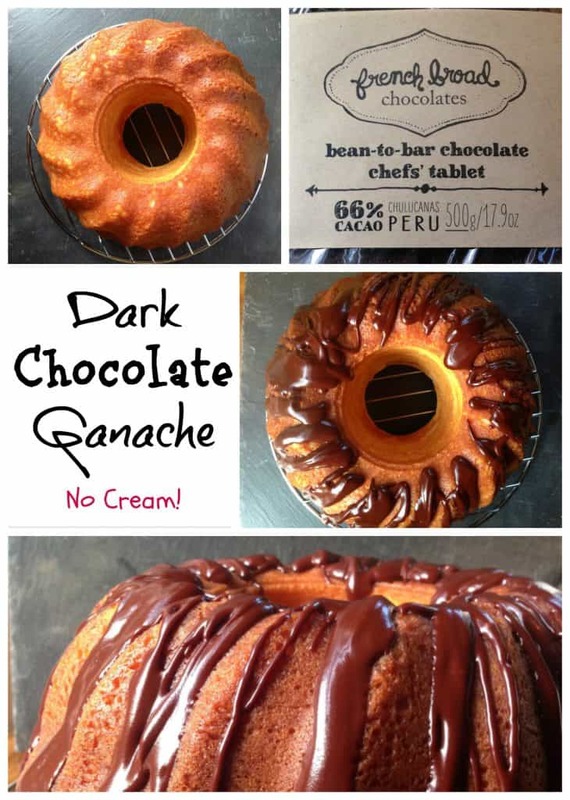 I had no idea you could make ganache without cream! I love French Broad! Fantastic chocolate! Just rereading this post makes me want to plan a trip to Asheville for the weekend! You nailed this Erin! I am totally going to give this a try – it looks PERFECT! Oh, no, Kay! Glad you could fix it!! Can it be made with salted butter? Hi! Yes! I rarely have unsalted butter in the house – so I often find myself using salted butter with no issues. thanks for the feedback, Priya! Thank you for this wonderful cream free genius! Before I attempt it, will it go hard enough to then ice over with fondant, I would like to use it to crumb coat before icing a celebration cake. Hi Julie! I don’t think it will harden enough to be used as a crumb coat under fondant! I wish. That would be delicious! Hi Erin, can this recipe be used with white chocolate as well? I’m making a drop cake for my cousins graduation party and I have no cream! (Oh no) I don’t have time to run back to the store, I saw this and I hope it will work! Hi! Just seeing this! It should work. Could you chill this in the fridge then whip it? If not is there anyway to make it lighter? Great question! I am not sure if that would work or not. Generally, I specifically make a ganache when I want to drizzle it thickly on something. Let me know if you try to chill it! Can I make , drizzle it on and serve the cake the next day? Yes! I have served it the next day. Hi, Lou! I hate that your ganache was not the right consistency! Different people want different things from their ganache. If you want a more liquid, pourable chocolate ganache, you generally want a ratio of 1:2 – hard chocolate to liquid. If you want a thick glaze or something to use between cake layers, you would want a ratio of 1:1 generally – chocolate to liquid. This recipe is definitely geared for pouring chocolate over something. I am wondering if our butters were very different or if you just had a thicker ganache in mind when you were making this! I am glad you figured it out. I’m late to the party, I know. I just wanted to let you know that this worked with non-fat milk too. I love using up ingredients that are at the end of their life! !